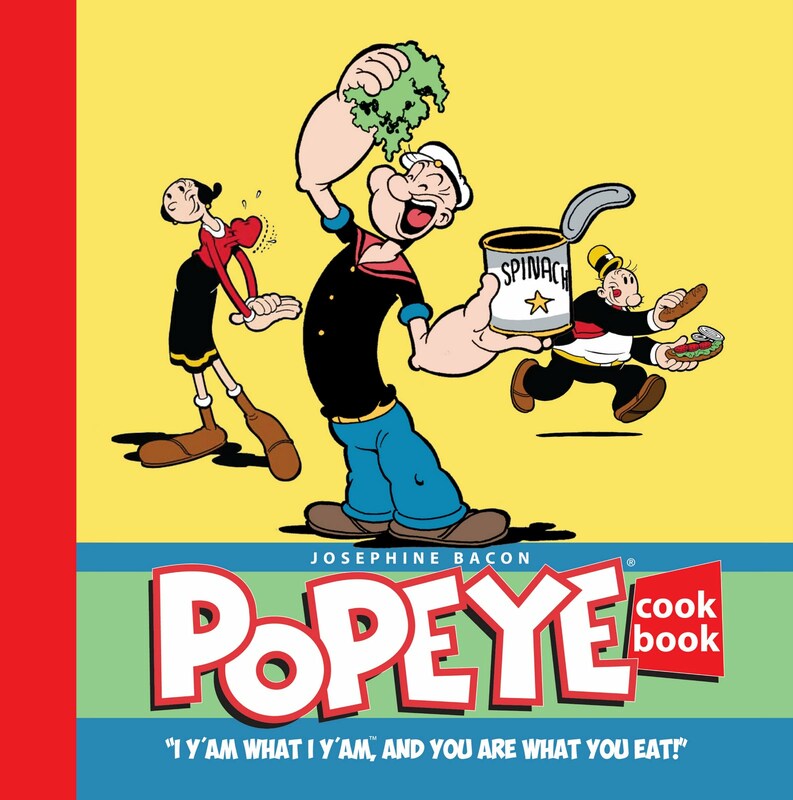 I suppose if you were going to try to tie any comic property to a cookbook, Popeye would make the most sense. He is uniquely identified with food (well, spinach) while many of the surrounding cast are either named for foods (Sweet Pea, Ham Gravy, etc.) or are voracious eaters themselves (Wimpy). But the execution here is something of a strange bird. 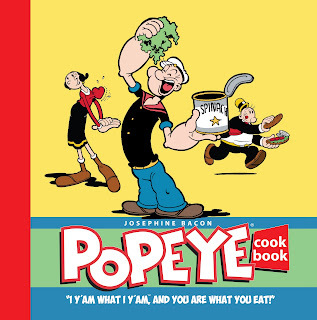 Author Josephine Bacon doesn't particularly come across as a big Popeye fan herself. She makes several references to Segar and his characters in her introduction, but nothing that a little common knowledge and a short crib sheet couldn't explain. Many of the recipes throughout the book do indeed feature spinach, but it's definitely not a "1001 Spinach Recipes" type of book. There's a broad range of dishes covered, from salads to meats to soups to deserts. The recipes are presented in a fairly straightforward manner with minimal to no embellishment beyond the ingredients and instructions. So, after the introduction, the only real textual references to Popeye's world are the names of the meals themselves, like Bluto's Baked Lamb Shanks and The Witch's Clam Chowder. The book is peppered with spot comics and illustrations of the Popeye cast. The illustrations look like relatively recent "clip art" from King Features: isolated character shots on clean backgrounds. Not bad art, certainly, but they feel a little stiff, even with the fluidity of the characters. Picture the illustrations that show up on the cover, but by themselves without context and all about the same size. There are also several particularly food-themed "Thimble Theatre" comics reprinted throughout the book. Curiously, though, they are all from when Bud Sagendorf was working on the strip between 1959 and 1986; despite the early references to Segar in the introduction, none of Segar's work appears and Sagendorf's signature is plainly visible in each comic. Also curiously, there are some instances where a single panel is presented. It's fairly clear to me that was for design/space issues -- they needed something to fill a blank portion of the page and there wasn't enough room for a good spot illustration, much less a whole strip. But the curious part is that they always use a panel from one of the comics they already reprinted in the book. I can see why they were trying to focus on food comics, but for the single panels, I wouldn't think it would take that much more work to find a different image of Wimpy eating a hamburger or Popeye opening a can of spinach. The last criticism I might level is one that is more likely to come from the S.O. than me directly. She really enjoys cookbooks and reads a lot of them. But she hates it when cookbooks don't provide photos of what the finished meals should look like. I get that food can be really difficult to photograph well, but she has repeatedly said that she's not going to bother with a cookbook that doesn't have pictures. No photos, and it will go back on the shelf after barely a cursory scan. I don't know how common her opinion is on this, but I will note that the The Popeye Cookbook contains zero photographs. I really haven't said much positive about the book, and that's probably a disservice to Bacon. I'm sure the recipes are delicious. Or they would be if I could cook. But the book doesn't seem to have a solid focus on who it's for. Bacon notes that the recipes, by and large, aren't that difficult or unusual, so it's not likely to appeal to those just interested in cooking. And the Popeye connection turns out to be pretty weak; some window dressing for a cookbook they probably wouldn't bother looking at otherwise. The only people I can honestly seeing buying this are die-hard Popeye fans who need everything they come across with Popeye on it, and friends and relatives who know someone who likes Popeye and this might make a good present for them. Then again, it's being published by UK publisher SelfMadeHero, so maybe there's a larger Popeye fanbase in Britain than here in the States. But it still seems like a weak connection to market a book on. Popeye turns up in some odd places these days (not even counting Weapon Brown). The only Popeye comic book I have is an item I picked up at MidOhioCon a few years ago, from the creators who were there shilling for it pretty enthusiastically. It's a rather entertaining item, though, placing Popeye into a kind of meta-narrative about Popeye. In the first half he meets his creator and the real-life inspirations for himself and various other characters. Then he goes on a road trip to modern-day Chester, IL, which along with the exclusively-local advertising in the comic makes the latter half into a kind of promotional tourist publication for the town and its Popeye-related attractions. A novel little item, though, as I say; you'd probably enjoy it a good deal more than this cookbook.